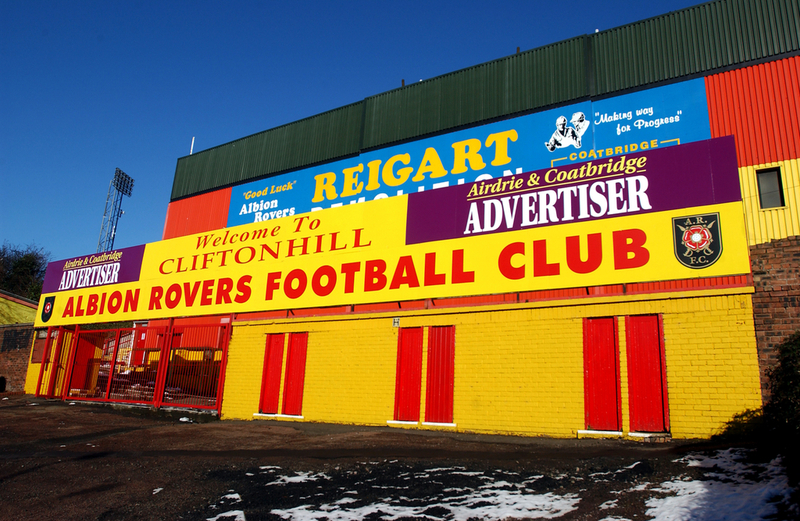 Languishing at the foot of Scotland's League Two - the country's fourth tier - with just one win to their name and eighteen defeats, Albion Rovers were, statistically, the worst team in the United Kingdom at Christmas. The club had taken just five points from a possible 48 and found themselves in dire straights. Back-to-back relegations seemed imminent for the club who had finished rock-bottom of Scotland's League One just a season before, while the prospect of dropping into the Lowland Football League - the Scottish fifth tier which contains several amateur teams - was a thought which gravely frightened the club. 'The Wee Rovers' went on one of their worst-ever runs between the 6th of October and 12th of February, winning precisely 0 league matches. Just to clarify things, that's over four months without a single victory with just three draws to break up the endless flow of defeats. Four. Months. Manchester City won fifteen games in that time, and while that example is right at the opposite end of the spectrum, it does put things into perspective and show just how poor Albion were throughout that period. Even Blackburn won eight games during that time and they've not exactly had a fantastic season, have they. With the club in such a dangerous position, something had to be done. In October, following an embarrassing 2-0 defeat at home to Highland League outfit Formartine United in the Scottish Cup, manager John Brogan was given his marching orders. Brogan, who'd began his playing career at Albion in the early 70's and went onto make over 100 appearances for the club before departing for St Johnson in 1977, lasted just five months in charge of the North Lanarkshire club, with Kevin Harper appointed as his successor at the start of November. Harper's appointment made headlines in Scotland, as he was the first man of black, asian or ethnic minority to manage in the country since Brazilian manager Marcio Maximo, who spent a brief period of his career in charge of Livingston in 2003. Before Maximo's four-month tenure at the West Lothian club, the only other black, Asian or minority ethnic managers to have taken charge of a team in Scotland were John Barnes at Celtic, Dave Smith at Montrose and Claude Anelka - older brother of Nicolas - who actually hired himself at Raith Rovers in 2004. The spotlight has been firmly on Harper since his arrival at Cliftonhill, but since the 43-year-old joined the club, who just months ago looked beyond help and destined for relegation, events on the pitch have started to take a surprise turn. Success wasn't instant for Harper, however. In fact, things couldn't have started much worse for the former Portsmouth and Derby County winger as he lost nine of his first 12 games in the scorched hot seat, drawing three. His first taste of victory wouldn't come until three months after his appointment, but when it did, the wheels really started to turn for the 7-capped former Scotland U21 international. Sometimes in football, you need a bit of luck and in mid-February, that's exactly what happened for Albion as they were handed a 3-0 win by the SFA after their opponents, Clyde, fielded and ineligible player during a narrow 1-0 win over Rovers at the Broadwood Stadium. This stroke of fortune was to kickstart something special for Albion; they've now taken 10 points from a potential 21 in the past six weeks, which is probably not worth shouting about for most sides but considering the position Albion found themselves in throughout the tail-end of 2018, can be deemed as an extremely promising step in the right direction. Three consecutive wins against Stirling Albion, Elgin City and Cowdenbeath during March have seen Albion Rovers climb out of the League Two relegation zone (which it's worth noting only contains one team), into ninth-place - Albion now sit a point above Berwick Rangers with just five games of the campaign remaining. With only ten teams making up the Scottish fourth division, teams play each other four times during a season and with the gap between Rovers and eighth-placed Cowdenbeath currently standing at 11 points, the battle for relegation is now between two teams and two teams only - Albion and Berwick Rangers. The pair meet for the fourth and final time at the end of the month in the league's penultimate fixture, with it looking likely that whoever loses that clash will face relegation to the fifth tier. There's still a long way to go, and a lot of hard work to do for the Scottish club, but should they pull off a shock fightback to remain in the Scottish Football League, it'll be one of the best stories ever told in that part of the world. The fight for league survival is on after three consecutive wins in March (BBC Sport). Most players plying their trade in the Scottish lower leagues are, well, Scottish. They've came through various SPL clubs' academy systems or worked their way up through non-league. Some may have started their careers in England, drifting north of the border in the hope that they can fast track their way through the pyramid in the less-demanding Scottish leagues before giving full-time professional football another crack. Rarely though, will you find a Spanish 'flare' player tearing up the already heavily torn up pitches of East Fife and the like. This season, though, Albion Rovers have benefitted from the desire held by one intelligent Spaniard with a thirst for knowledge, business studies and tourism. Yes you did read that right. Gerard Hernando Escuriola, the 23-year-old midfielder who started his career at La Liga giants Villarreal before a series of severe knee injuries seemingly put an end to his career in the Spanish top-flight, became the club's most unlikely of signings when he signed in November following a successful trial. Escuriola had dropped down the levels in his homeland following his release from Villarreal before eventually relinquishing his dream to become a professional footballer, instead opting to gain a first-rate education in business and tourism. Last summer, the savvy student joined the Erasmus program for students - a scheme in which the EU provides an opportunity to gain a degree in a foreign country - his chosen destination? The University of the West of Scotland. After settling in Scotland, Escuriola was keen to keep fit and play football, at whichever level he possibly could. A brief spell playing for amateur side Woodhead AFC would have everyone talking and before long, Albion Rovers - at the time the worst side in the Scottish Football League and without a win in months - offered him a trial. The rest was history for Escuriola at Albion, he scored an absolute worldie from the halfway line against Edinburgh City almost immediately after joining the club and has now helped them scrape themselves off the base of the table. The 23-year-old will return to Spain this summer when his course comes to an end and his contract with Albion expires; whether or not he'll leave a club legend remains to be seen as the threat of relegation is still rife for Rovers, but one thing's for certain, it's been one hell of a cultural experience for the lad.